A kitchen appliance that is often overlooked when time comes to redecorate the place. Take out the sink, the cabinets, replace them all, and any old faucet will do. They all run water the same, right? Hot, cold, lukewarm, simple devices that every sink basin is in need of. But why settle for the simple, ugly looking faucets of old that rattle and sputter in use, when instead there are so many options out there available to you. Tailored to your style and needs. In this guide, we will be taking you through different types and styles of the best touchless kitchen faucets available on the marketplace to date. From hot brands to lesser known items that still pack the same amount of dynamism for less. We have collated some of the best touchless kitchen faucet reviews and full hands on appliances to help you in your search for the nest centerpiece of your kitchen. 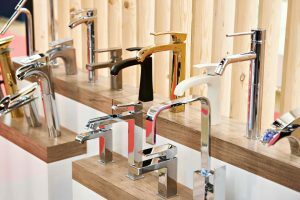 To help you in the search for your ideal faucet, there will be information covered below on everything you need to know about the device, so that you have every base covered going forward. From specific features, to materials used and how that can affect the flow, all to lead you to the perfect model. 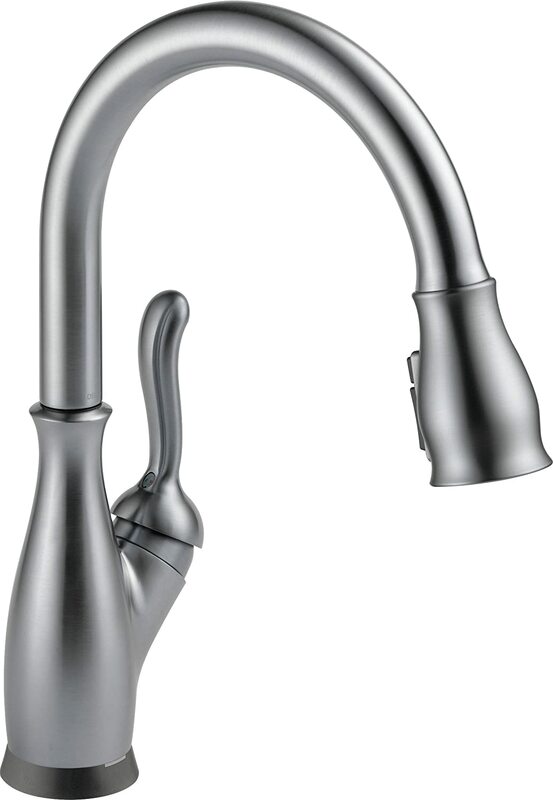 1 What Should You Look For When Choosing a Kitchen Faucet? 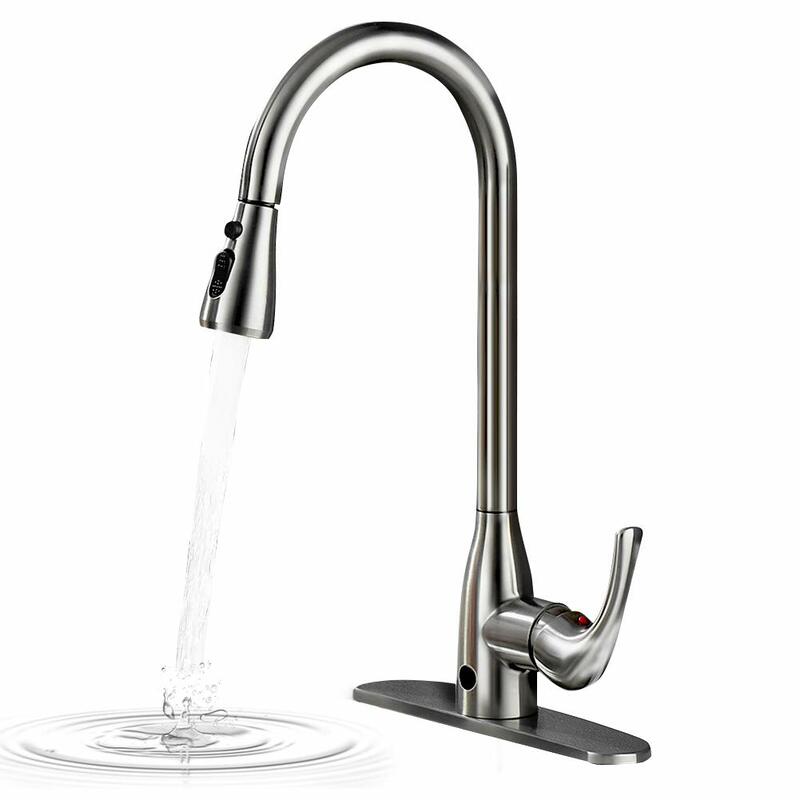 Here, we have listed all the touchless kitchen faucet reviews we have found to be the very best on the market, though hundreds of reviews, testimonials, and articles of research. Apontus Modern 16.3" Brass // Zinc Anti-scald resistant materials. Kohler Malleco Pull Down 28.5" Solid Brass // Premium Metal Construction Malleco Sensor. Moen Align 22.5" Brass // Stainless Steel finish Ultra flexible pull out hose with a PowerClean spray. DuraLock quick connect. 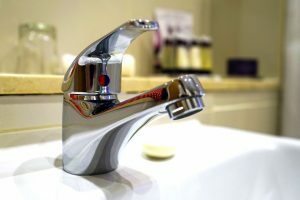 Before we get into detail about all of the faucets we have listed above, first it is rather important to learn about the different features that you will come to expect from them all. What Should You Look For When Choosing a Kitchen Faucet? The mounting hole is located at the back of the basin and allows a faucet to connect to your water main pipes beneath the sink. Depending on how many taps, valves, or levers there are on the faucet, that is usually how many mounting brackets will be needed. More cane be added to your basin if you find the piece of your dreams in the below touchless kitchen faucet reviews, just keep in mind how many you have pre-purchase otherwise the simple job of affixing the one pipe may be doubled. This feature speaks for itself as to what it entails: levers or touchless controls. 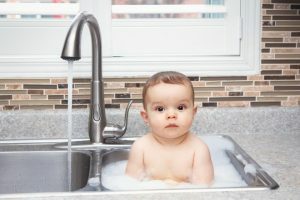 In recent years, the technology available for touchless faucets has skyrocketed in popularity, which makes searching for the best touchless kitchen faucet to suit all of your needs a little tricky to do. The most common sensor is that of the LED enabled ones. Brushing a hand over the sensor starts the flow of water. Sometimes, there is need to use a lever on the side to control temperature, but others have worked at altering temperature with hand movements. Similar to that of a theremin. The two positions of stationary or swivel are to do with the overall movement of the faucet after it has been affixed to the mounting hole. A stationary faucet is attached to the main, position, and then immobile. Where as the swivel body faucet can have up to three moving areas, like the spout, body, and mount, all to be more maneuverable for the user. 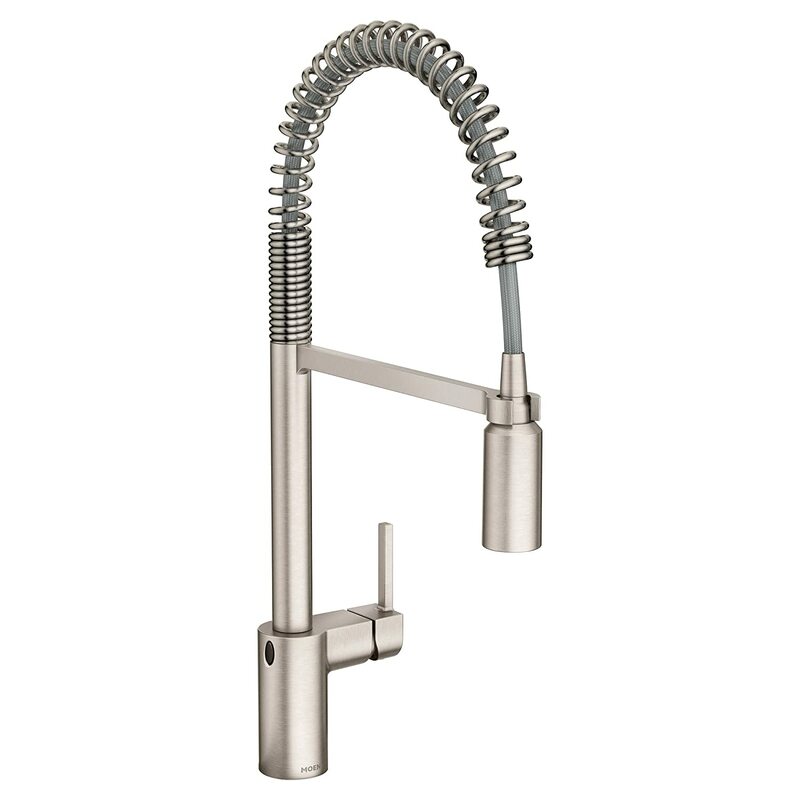 Description: The Moen Arbor Motionless Faucet is a unique and fantastic addition to any modern kitchen. Its simplicity is second to none from installation to full use for all the family. With the dual sensors made available for the user on the top of the high arch and at the base of you spout, is an incredibly adaptable asset to any basin unit. There is also a 68” hose extension that makes tasks like washing the dishes, fruit and vegetables, and merely bringing water to the kettle, are easier tasks to accomplish. The tap adjusts between hot and cold water with a single lever, and the faucet can be transformed into a maneuverable spray hose by pulling at the faucet head. This feature offers you far more room for pots and pans, should the need (or the pile of dishes) arise. The Arbor boasts a simple installation requirement with the 1 Hole method. With no deck plate needing to be attached before the faucet is affixed to your sink basin, all that needs to be done is mounting the faucet to the joining water pipe. Easy. The Moen company are so confident that their faucet is the soundest of purchases, that they offer a lifetime warranty against leaks. Their confidence stems from quality workmanship, the highest standards of manufacturing, and standards of requirements that have been easily held throughout the construction. 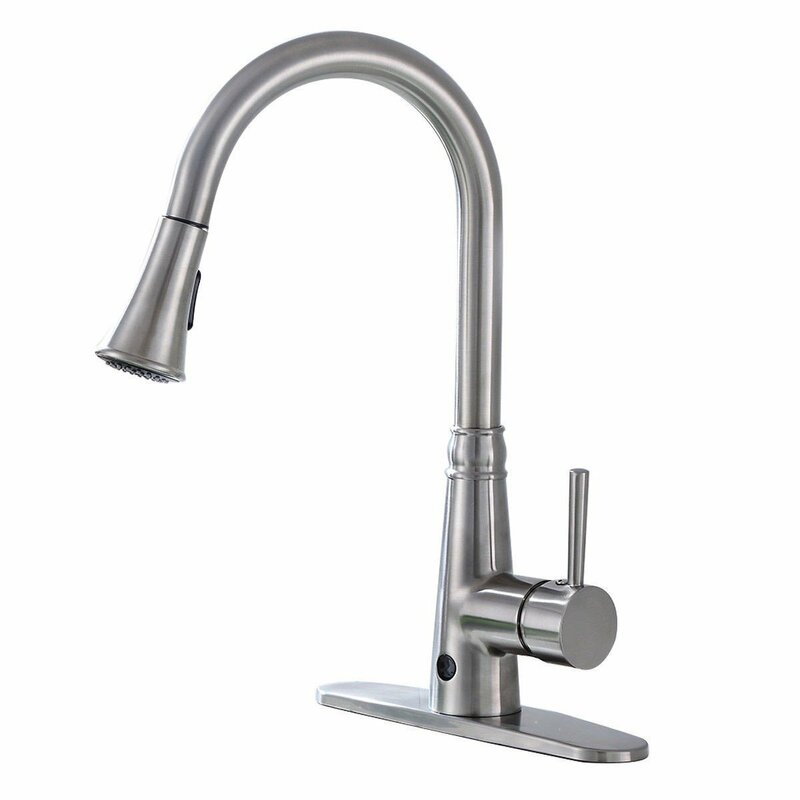 Description: The Delta 9178T-AR-DST faucet is an easy to maintain, high class addition to your next kitchen refitting. Ease of installation with a choice between 1 or 3 hole install, adding an optional escutcheon in case you need it in the process. With the revolutionary Touch2O technology, all you have to do to start the flow of water is apply little touch to any area of the spout or handle and to stop the flow all you need to do is tap it once more. This tech turns your faucet on and off with the ease of a clapper lamp, reducing the spread of germs and maintaining hygiene. Another neat little feature to the Delta, are the LED light indicators it comes with. An LED light which runs blue when the tap is in use and then red if the batteries need changing, and the incredibly useful TempSense LED light which indicates temperature. Ranging from blue, to magenta, and finally, to red. As well as having all of this, the hose extension sprayer is equipped with MagnaTite Docking. A series of powerful magnets that keep the sprayer wand in place when it is not in use. Special Features: Constructed using anti-scalding materials to ensure safe use. Material: Interior Brass design and a sturdy Zinc body. Description: The Apontus Modern is the first on our list to showcase the brilliance of a faucet with built-in infrared sensor, making it a hands free device with its automatic motion sensor. All it takes is to bring your hand close to the sensor and the water will start to flow. Temperature control is still worked out through the side handle, but having the option to start the water flow with a sensor is just too good to resist. This sleek and modern design has spared no expense in maintaining its look. 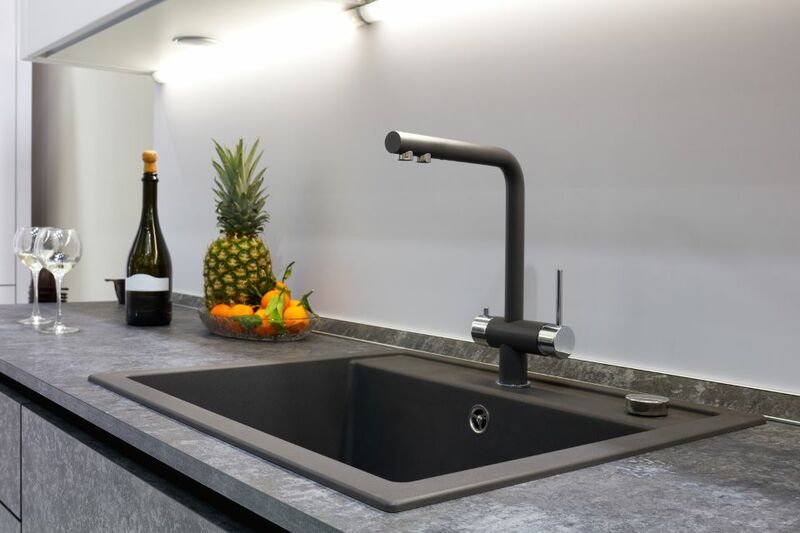 The exterior material of the faucet is constructed using a highly durable zinc alloy that is also rust and scuff resistant, regardless of how many pots and pans you manage to stack against the spout in the sink. One of the best, and most interesting facets of this faucet, is the fact that that as well as being constructed using a rust and scuff resistant alloy, it was also designed with anti-scald and high-temperature resistant materials. Ensuring safety in every use, for every user. 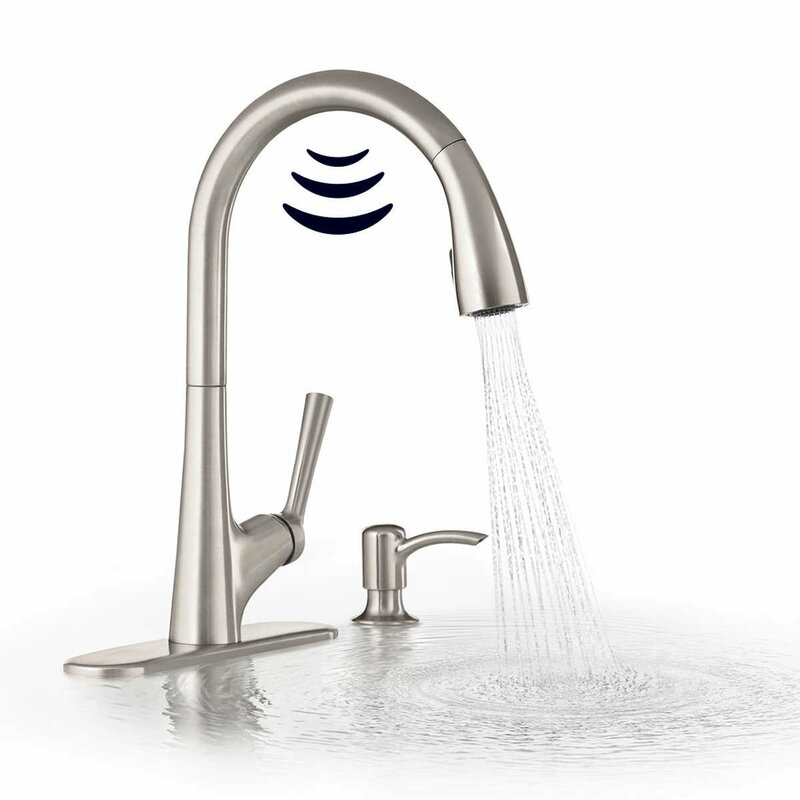 Description: The badiJum Touchless Faucet gets it title from the infrared sensors that it uses in its working. The dual mode sensor technology works fast and reliably to give you and your family better living hygiene and allows for more ease of use. The sensor works for the pull down hose as well as having its own unique switch for use. In the construction of this product, badiJum went all out with patented tech to make sure that this is the only faucet that you will ever need. The Fast Clean Technology makes the sprayer head engineered to work through three spray patterns and return to a bone dry clean baseline. Its patented designs have made it incredibly easy to install that you do not need a plumber present to aid you. Quick connect push-fit controls to the mounting hole and you are ready to go. Another brilliant addition to this faucet is the lifetime money back guarantee badiJum offers, and the three year replacement of the integrated control box makes this appliance a hard one to say no to. Special Feature: Malleco Sensor and the MasterClean Sprayface. 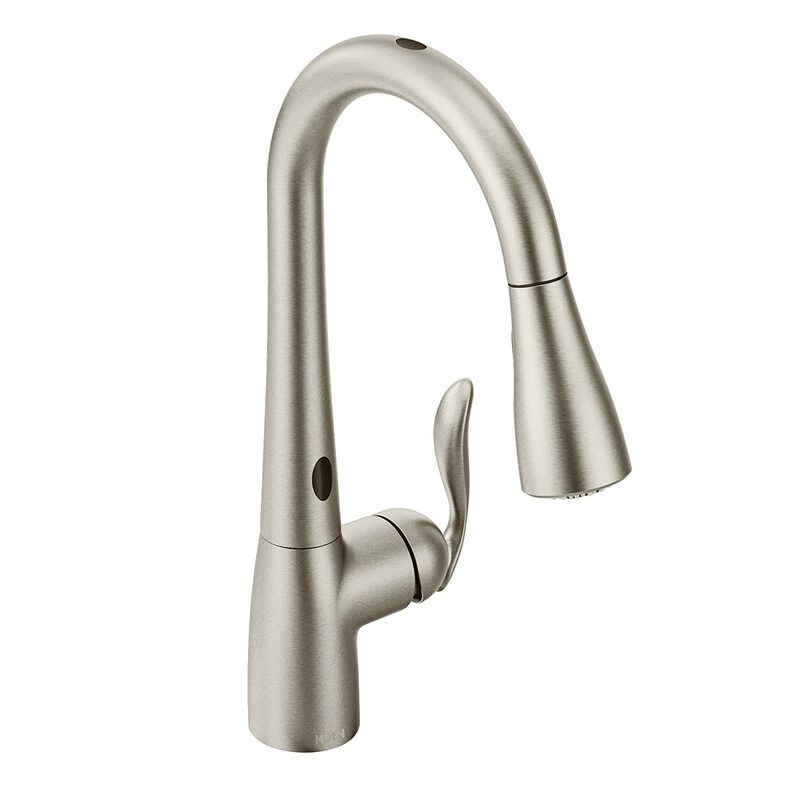 Description: The Kohler Malleco Pull Down seems to be the most accessible stylistically in all of these touchless kitchen faucet reviews, as it just looks as though it would look the part in anyone’s kitchen basin. The high arch with a stainless steel finish, standing solidly. With the MasterClean sprayface technology present in the Kohler, the use of flexible nozzles that cut off the flow instant when out of use make it easy to clean. Description: The Moen Align is a powerful contender for being one of the best faucets on the market today. It is a reliable addition to any kitchen refurbishment, and is so outlandish in appearance that it can eclectically go with any style that you wish to adapt it with. The PowerClean spray that we are suggesting is the best feature of this faucet proves to add 50% more spray power in its water flow than many of its contenders. Having the incredibly flexible hose helps adapt to all of your needs and keeps the whole sink basin accessible in check. 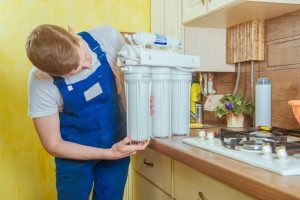 In reading this, we hope that you have learned a lot about the many features of a best touchless kitchen faucet on the market today can offer, and that you are looking in a better direction for your next faucet. Remember to stay on the lookout for interior brass construction, whatever finish you prefer the look of, and make sure to find out whether the faucet you have in mind comes complete with an extension hose. All the best ones do, and it is always good to have one and not need it than to not have one and fall short.